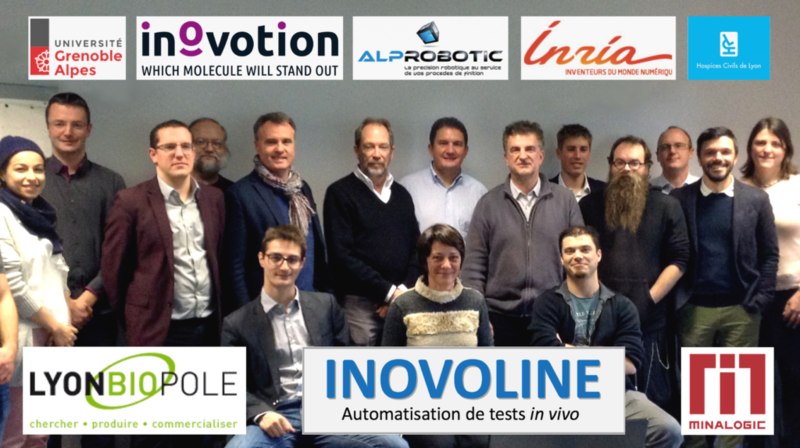 The 3.2 M€ INOVOLINE project was launched January 10th at INOVOTION’s offices near Grenoble. The project is funded by the industrial partners Inovotion and Alprobotic, as well as the Auvergne Rhône Alpes region, BPI France, Grenoble Alpes Métropole, and the Communauté de communes Le Grésivaudan. The consortium includes Alprobotic with expertise in robotics, the TIMC lab at University Grenoble Alpes (UGA) with expertise with in vivo imaging, INRIA’s expertise in Automated Learning, and the Hospices Civils de Lyon (HCL). Each partner presented the techniques to be used in the project, and their ambitions for its success. The technical objectives, three-year GANTT and expected performance were presented and discussed in detail. Technical discussions followed, during which the initial meetings and development phases were planned. The meeting was an excellent start to this ambitious project. All participants expressed deep enthusiasm to meet the technical challenges ahead! INOVOLINE leads the way to faster discovery of new cancer cures, and vastly improved patient care. This will be a world first for automatic in vivo testing.